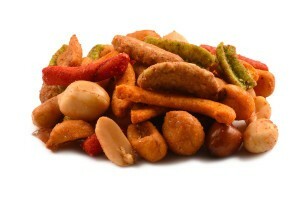 This sesame sensation trail mix features a mix of various shaped, neutral colored items. Don’t let the visual appearance lead you to believe that this mix lacks excitement. It is amazingly flavorful. The unique variety of textures the nuts bring to the mix and the crunchiness of the sesame sticks make this an astoundingly tasty snack. Sesame Sticks Roasted Salted, Peanuts Roasted Salted, Almonds Roasted Salted, Cashews Pieces Roasted Salted. This is a great blend of sesame sticks and nuts. Perfectly salted, simple ingredients, and made in America. Great mix and flavor. The sesame sticks are/were outstanding IMO. This was great tasting. The only thing bad I have to say about this was I was expecting more sesame sticks. Ordered a second time. While I still wish for more sesame sticks…this mix is tasty. I loved this mix because I really enjoyed the taste of the sesame sticks. 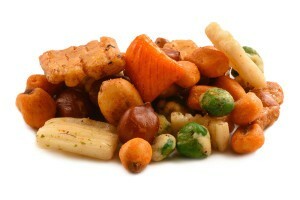 LOVE the sesame sticks in this mix! Our office loves this mix. Our office LOVES this mix. Sesame sticks are a good addition. It’s a great mix. Would prefer more sesame sticks, but loved either way. This is a great mix for the sesame lovers in our office. It’s a simple mix with loads of the sesame bites to enjoy! The delivery is always fresh. We will definitely be ordering this one again!